As a solo practitioner law firm, the Law Office of Mary C. LaGrone is able to offer valuable legal services, more than 8 years of experience as an attorney and over 17 years of experience in the legal field, in addition to her M.B.A., and personal attention and representation at competitive rates. Contact our Rutherford County estate administration attorney for a consultation. Our firm believes in providing quality legal service to individuals throughout the Nashville metro. We use our law experience and diverse background to provide the services that our clients require. Our Tennessee divorce attorney has served as an advocate for children, parents, and grandparents in child custody cases. She actively participates in pro bono work for the Nashville Bar Association Probate Section and frequently has served as guardian ad litem, conservator, or trustee. Additionally, our attorney is on the homeowners' board and Kids on the Block, and is active in the Lawyers Association for Women (LAW) and Junior League in the Nashville Community. 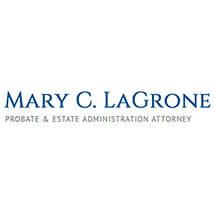 If you need assistance with a probate, divorce, business insurance defense, or other complex legal issue, the Law Office of Mary C. LaGrone has the experience to assist you. Contact our Nashville family lawyer and estate administration attorney to discuss how we can assist you.